LAS VEGAS (CES Booth #14200), Jan. 5, 2011 – Sony today announced the new wireless HomeShare audio system that allow users to listen to music from their Digital Living Network Alliance (DLNA®) certified PC and Sony Blu-ray Disc™ devices throughout the home over Wi-Fi® (802.11b/g). The new HomeShare products include two wireless network speakers (SA-N300 and SA-N400) and two Wi-Fi network iPhone docks (NAS-SV20i and NAC-SV10i). The company also introduced a new Wi-Fi universal remote (RMN-U1) that works with the system as well. The HomeShare system frees user’s music from being tied down to a specific device. The system uses an existing Wi-Fi home network with broadband Internet connection to stream music from a PC or from integrated BRAVIA Internet music services such as Slacker Internet Radio and vTuner, to each speaker via a compatible Sony Blu-ray Disc player, Blu-ray Disc home theater system or one of the new HomeShare docking devices. The speakers can playback different music or can all be synced to one source with Sony’s unique PartyStreaming feature. Also, users can control the system via a PC, Sony’s new Wi-Fi universal remote, or an iPhone®, iPod touch®, using a free application that can be downloaded from the app stores. The products are aesthetically pleasing making them appropriate for any décor, and they deliver the superb audio quality consumers expect from Sony devices. Sony’s new HomeShare Wi-Fi network speakers include the SA-NS400 and SA-NS300. The models feature a compact, 360 degree directional speaker design that delivers room-filling, clear audio without limiting the listening position. With integrated Wi-Fi (802.11b/g), the models wirelessly stream digital music from DLNA enabled PCs or BRAVIA Internet music services from new Sony Blu-ray Disc devices. The SA-NS400 wireless network speaker will be available this spring for about $300 and the SA-NS300, also available in March, will be about $200. 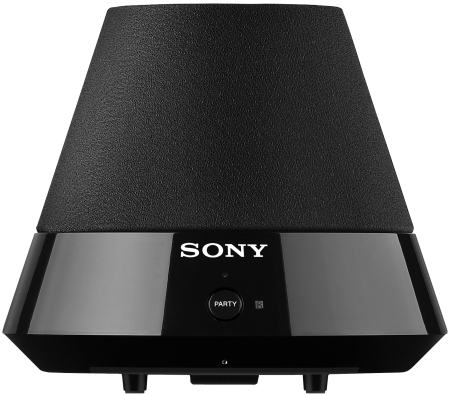 Sony’s HomeShare NAS-SV20i speaker dock allows users to play back music directly from BRAVIA Internet music services or from an iPhone/iPod Touch mobile device. Users can also stream music from the docks to other Sony Wi-Fi network speakers throughout the home. The NAC-SV10i dock connects to your existing home theater system and playbacks music from the mobile device or streams it to other HomeShare speakers throughout the home. Both models feature integrated Wi-Fi (802.11b/g) and offer PartyStreaming functionality. They also feature BAVIA Internet Video music services built-in, which can be shared with the SA-NS400 and SA-NS300 network speakers. The NAS-SV20i and NAC-SV10i will both be available in March for about $300 and $230, respectively. Also compatible with the network audio system is Sony’s HomeShare RMN-U1 Wi-Fi universal remote control. 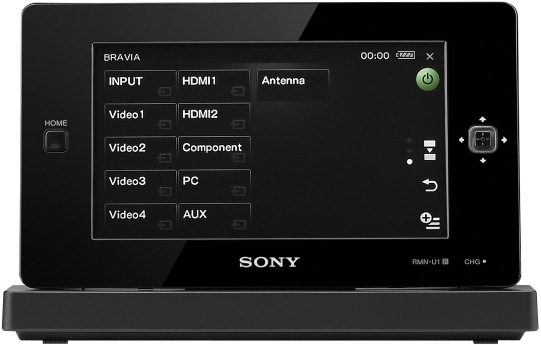 Featuring integrated Wi-Fi (802.11b/g), the touch-screen model controls the network audio products and certain new Sony connected BRAVIA televisions and Blu-ray Disc devices via DLNA and other home theater components via infrared. The HomeShare universal remote provides simple activity-based control of home theater product and the ability to send music through your home network to HomeShare speakers in any room. Users can easily navigate music with jacket art and send songs to specific HomeShare speakers in any room. Simple guided set-up makes activity creation and independent and grouped control of HomeShare Speakers easy with no PC programming required. The HomeShare RMN-UT Wi-Fi universal remote is available in March for about $300.